Updated & bright 3 bedroom, 2.5 bath condo close to everything. Enjoy tons of amenities and total convenience. Recently remodeled condo with open concept living area, kitchen and dining area. This condo has tons of natural light. Enjoy the sunshine on the outdoor deck and the convenience of Telluride Lodge's amenities and location. 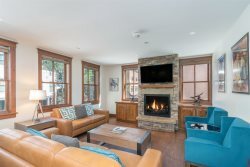 Your staff is friendly, professional, and knowledgeable and always makes our stay in Telluride most enjoyable! You guys pay attention to details and exactly the type of place we are looking to rent and work with our budget! Customer service was excellent , amenities at the rental were excellent too.